Often we think in terms that are black and white. For tests and assignments at school we might have been focused on getting “the right answer”. However, real-life problems are often more complex! For many problems there isn’t a single “right answer”, only different approaches with different strengths and weaknesses. Even when there is an objectively correct answer, it can be difficult to prove. The focus in many university assignments is less on “getting the right answer” and more on establishing the level of evidence for a conclusion, or the strengths and weaknesses of a particular approach. To do this effectively, you need to develop critical thinking skills. Forming judgements based on sound reason and evidence. Everyone practises these skills to some degree in their everyday life. For example, if you wanted to buy a new set of headphones, you might weigh up whether it’s worth getting the expensive ones. They might have extravagant claims about sound quality on the box, but is that really true or just marketing hype? Do they have good reviews? If the cheap ones are good quality, why are they so much cheaper? Perhaps the company that makes them cuts costs by exploiting their workers? However, we often end up taking shortcuts or automatically following a habit without even realising it. We might just buy the same brand we got last time, or might not think about how the product is manufactured because it’s less obvious than the low price. These shortcuts do have a purpose – it would be very time-consuming to fully investigate the supply chain of everything you buy – but they can also lead us astray. The “fake news” outlets that have recently caused so much concern often exploit people’s habit of using shortcuts instead of applying critical thinking skills. When you’re making important decisions, you need to make sure you thoroughly consider the relevant evidence and issues. You want to make good decisions based on sound reasoning. That’s why showing critical thinking and analysis is a major component of many of your assignments. To help you develop these skills, expert Library staff have developed an online tutorial designed for students. 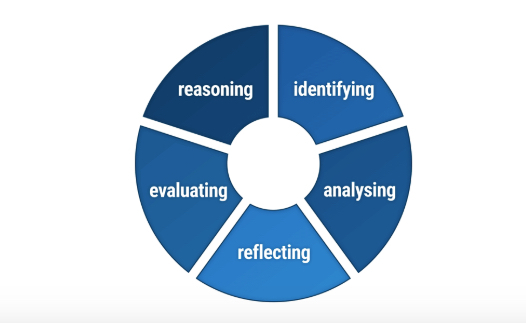 This tutorial explains in greater detail what it means to be a critical thinker, through a series of self-paced, interactive modules on Reasoning, Identifying, Analysing, Evaluating and Reflecting. It is an excellent starting point for learning important skills not only for university, but also your future career. Stay tuned to the blog in the coming weeks, as we will be looking at another aspect of critical thinking: how to evaluate sources for your assignments! The writer, Clinton Bell, is a librarian at the Law Library.